Descend into the caves and attempt to hug five monsters! Each monster has a unique personality and a presents a unique threat. Study them and await your opportunity to give each one a hug! hi friends. 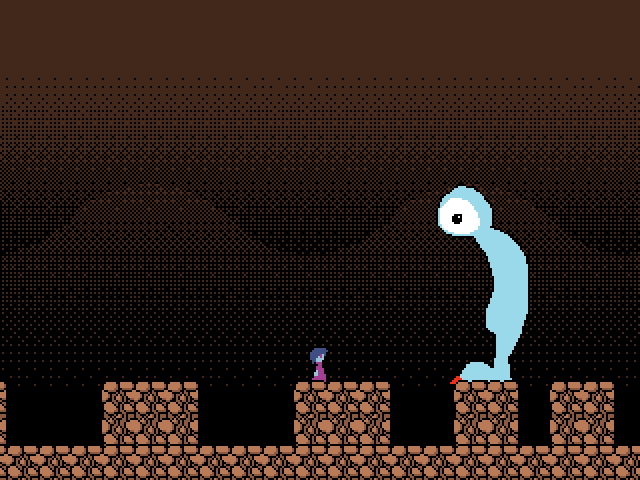 this is a game I was making anyway, but I guess it fits the Bo-tober prompt well enough! I actually intended to make it some time between 6 and 9 years ago, but it is finally here. Inspired by/somewhat made for my friend Eli Z. McCormick. I usually don't stick around long for challenges, but I wanted to get that look from each of the monsters when you hug them. I was fond of meeting the one-eyed guy and the levitating starfish-headed creature. Kind of reminded me of descriptions of Lovecraft's Elder Things. Aw, shucks. Thanks. Glad that their happy faces kept you going (I didn't originally want this game to be as difficult/frustrating as it is, but I have my impulses and they are hard to control). That was something that had occurred to me as a possible way to read the protagonist after I designed them, but I decided I liked the ambiguity. That was fun! Learning that you could walk within the monsters' hitboxes at certain safe times to complete the hug was good.